The second to last grand prix remaining for the 2010 Formula 1 season, 24 drivers along with teams realize these final races of the year as the final opportunity to score power and glory. Some drivers like Fernando Alonso, Mark Webber and Lewis Hamilton the Formula 1 world driver's championship is at stake making every on-track session precious time. 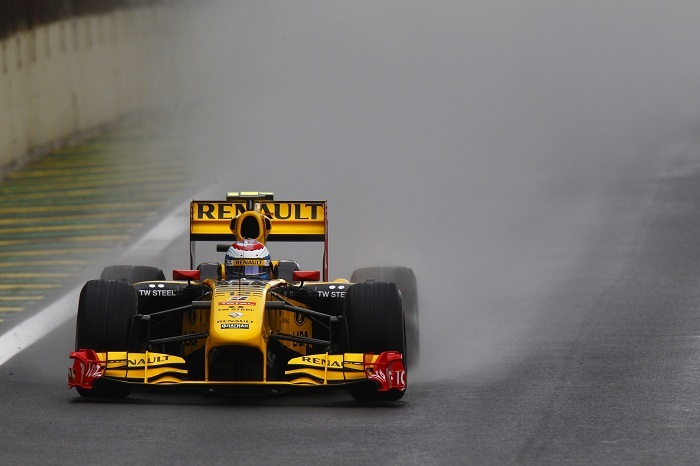 As predicted, rain swept over the Autódromo José Carlos Pace in time for Formula 1 qualifying Saturday. However, a break in the wet weather presented itself during the timed session allowing for tire strategy to figure handsomely into the team's planning for Brazilian Grand Prix qualifying. Fernando Alonso led Q1 with 1 minute, 1.987 seconds while Mark Webber's Red Bull-Renault would top Q2 with 1 minute, 18.516 seconds. As weather improved into the Q3 session, the option of running the Brazilian circuit on slick tires was actually a viable option. When drivers were chanced on the dry weather tire, lap times plummeted to nearly 4 seconds under the Q2 fastest times. With times under the 1 minute, 16 second range coming from Lewis Hamilton's McLaren-Mercedes, Fernando Alonso's Ferrari as well as the Red Bull-Renault pairing of Sebastian Vettel and Mark Webber, a 2010 Formula 1 rookie beat all of them to start the Brazilian Grand Prix in the top spot. Piloting his Williams-Cosworth, Nico Hulkenberg rose from 9th place in Q2 to ripple a shockwave through the Formula 1 paddock with his first career pole at a 1 minute, 14.470 second lap time winning the spot by nearly a second over second place Sebastian Vettel. Hulkenberg and the Williams F1 team top qualifying effort marks the first time since the French Grand Prix in 1999 that a Formula 1 pole sitter drives with Cosworth power. It is also worth remembering that the Brazilian Grand Prix was the site of Cosworth's last glorious victory. In the 2003 race, Jordan F1 team's Giancarlo Fisichetta drove a Ford-badged Cosworth to what was than a remarkable top podium spot. Having owned the top of the speed charts on Friday, the Red Bull Racing pairing settled behind the Williams-Cosworth with Vettel taking 2nd and Mark Webber placing 3rd fastest. The Red Bull-Renaults were separated by little more than 1/10th of a second. One of the first drivers to brave the Brazilian track with slick tires, Lewis Hamilton slotted his McLaren-Mercedes into 4th place ahead of title leader Alonso's Ferrari. Set for Sunday at 11 P.M. Eastern time, we'll see whether the 2009 GP2 champion Hulkenberg will hold off the currently more elite Formula 1 outlets through the Brazilian Grand Prix.